I am glad to be back home now. It was a rather long weekend with the two races at the start of the weekend and then ended with a long day at the Poodle Agility Nationals down at Purina Farm near St. Louis. By the time we made it home last night Linda and I were totally exhausted and the dogs were like potato sacks passed out on the RV bed. That is when you know you have officially got everything you possibly could out of an extended weekend – of course, that made the workday a lot longer to ugh. Luckily, I was able to get at least one post out while traveling leaving me with only one more to hit my monthly quota – might as well get that out of the way while I am thinking about it. All I can say is gorgeous. 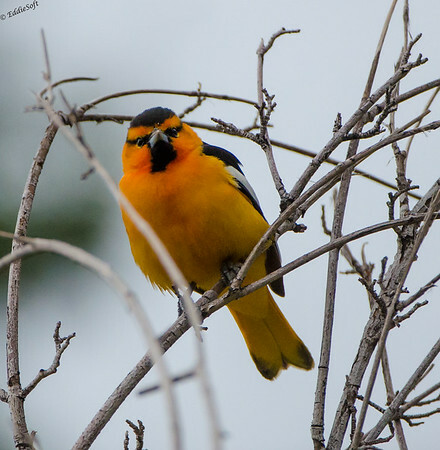 It may be due to the fact I am so fond of Halloween, but this has to be one of my favorite color palettes for a bird. Please overlook the composition and technical execution of this batch of photos. This particular specimen was hanging out in clearly the most tangled branch tree it could find to thwart my every effort to get a clean shot. Not sure what kind of tree this was, but it ended up not only providing excellent protection from The Beast, but it also looks quite menacing seeing as how some of the branches look like grey barbed wire. Hit the jump to find out what this bird is! 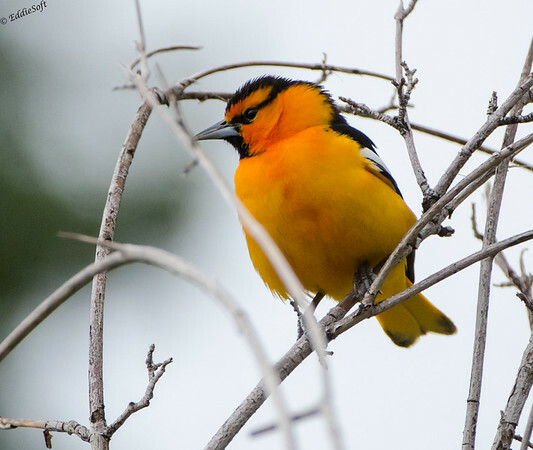 This bird is called a Bullock’s Oriole and more importantly, represents another +1 in my North American Bird List (cheering, ticker tape streamers, balloons and clowns being punched .. oops, did type that out loud – ignore that last one, nothing to see there, nada, carry on). 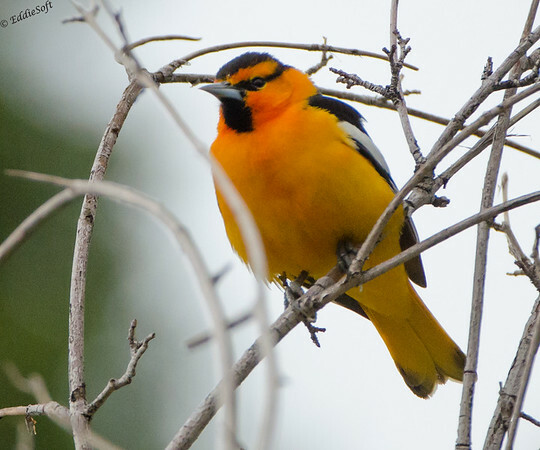 Obviously, this is not a bird you see in your Midwest backyard – maybe their brother the Baltimore but not this color blasting variety. These pretties prefer to hang out West. … and out West is where Linda and I were back in May of 2014. Specifically, we were at Red Rocks Ampitheatre. I usually just say it is near Denver (which it is), but going that extra mile for my readers uncovered that it is located in Morrison, CO. 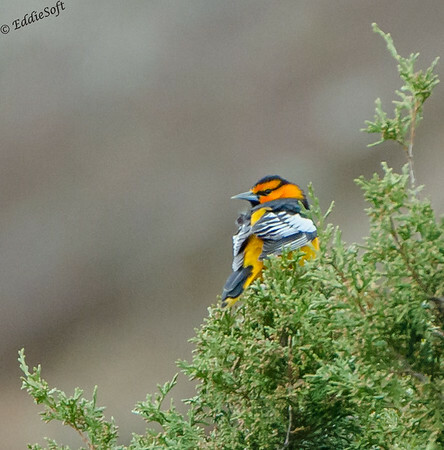 This would have been the first bird I saw upon arrival at that great birding site. Much like the fox (link here), there wasn’t a great deal of effort to get this specimen in the tin. After snapping away at the Fox, we simply walked to the first set of trees and there it was all pretty like. The part that made it hard was having to put the monopod on the edge of jagged rock overlooking a deep crevice and then balancing on a single foot on the top of it in order to get high enough to get halfway decent photographs (or I may have just sat on the ground and lazily pointed the camera in its general direction – choose whichever story gives more excitement to the end product hehehe). Pretty sure I have spent significant real estate talking about how great the birding was at Red Rocks, but would be cheating my readers if I didn’t relay the fact that Red Rocks is a great place to bird. If you are curious you can use the search box (yep, that one right to your left) to see all the bird posts that have come from there – and some other animals. Or you might want to wait a bit on that since there are plenty more in the hopper coming soon to a browser near you. I opted to leave this shot in just to show the interesting symmetry of the top notch, the neck patch and then the two eye-liners. Per my general rule, most birds just look mean (or completely stupid like the Green Heron) when taken head on. This also allows me to fulfill my brother Ron’s constant request to provide multiple bird angles for IDing – although this one was so obvious even I could identify it without much trouble. Speaking of angles, might as well include the rear shot – with the exception of the top down and the bottom up you should have a pretty good feel for what this bird is all about. Double score since the shot below is also in my signature pose of the over the shoulder look (except it was getting petty dark by then causing my ISO to enter grain land). Oh no, out of pictures. Hold on one second and I will look up some interesting facts. All pictures and no facts is a recipe for disaster with my loyal readers. – Please hum the Jeopardy song while I track down something worth relaying – According to Cornell, these Bullocks would get frisky with the Baltimores that overlapped their region. 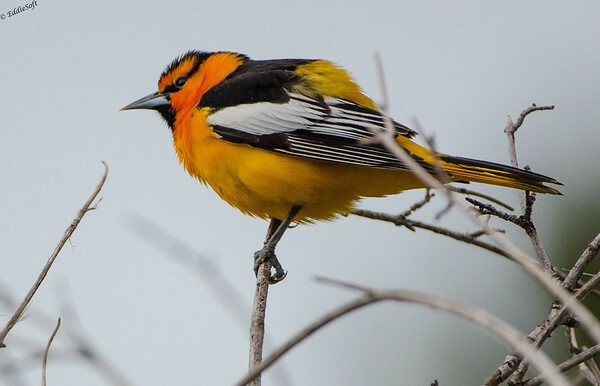 This resulted in them establishing the Northern Oriole grouping to represent the total set, but later genetics came through and they went back to individual classifications. (thankfully that allows me TWO +1s). If you are wondering about the name (I was), then you might be interested in knowing that it was named by William Swainson in the 1820’s in reference to English born William Bullock and his son while in Mexico. They will also steal nectar from Hummingbird feeders which must be interesting to watch seeing as how vicious the Hummers can be when something invades their feeder – likely to get a long shaft in a very sensitive location. Well, that is all I have for you tonight. Although not my best work behind the glass, still a pretty cool bird. Hope you enjoyed … and before the hate male comes in I know the Pistols would be upset about me hijacking (and frankly making the real title less offensive) their only studio album. 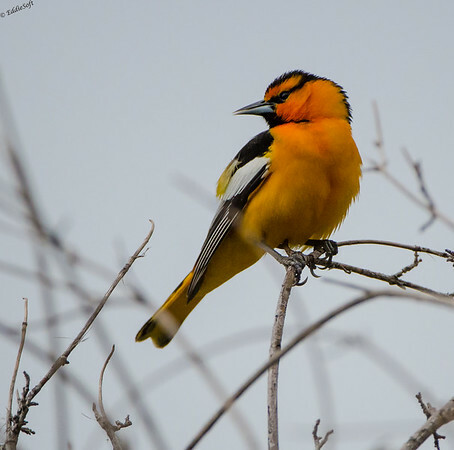 Wow, I’ve never seen a Bullock Oriole. I’ll have to look for it the next time I’m out West. I must say, this has been quite the barrage of comments – appreciated for sure, but wow!